On a fall night in 1929, the people of Chicago flocked to the National Shrine of St. Jude for the Solemn Novena. They came by the hundreds, filling the newly built Our Lady of Guadalupe Church, in which the Shrine is located, and spilling out onto East 91st Street. What were these pilgrims searching for? It’s a simple answer, and one that keeps the devotion to St. Jude alive today: the promise of hope. Times were tough, as they always seem to be, and people came with their suffering and their need for the intercession of St. Jude, patron of seemingly impossible and difficult causes. The fervent devotion of the people of Chicago that night spawned a legacy of hope that today includes nearly a million devotees united through the St. Jude League. 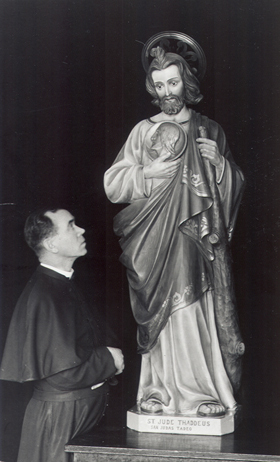 Since the founding of the National Shrine of St. Jude by Claretian Father James Tort nearly 90 years ago, the Claretian Missionaries have nurtured this ministry of hope. The gift of our affiliation with St. Jude guides us in our ministries to those in need in more than 60 countries. Our charisms of mission, evangelization, spirituality, and community are present in all that we do in the name of our founder, St. Anthony Claret of Spain. The Claretians will continue to remember you in our prayers, and we ask that you pray for us, too. Thank you for your continued support and steadfast devotion.